When I was looking for a new laptop under Rs. 35,000 I wasn’t sure about what configuration to go for. However when I started searching for best laptop under 35000, one thing was clear there were not many brands which were offering a core i5 processor within the budget. 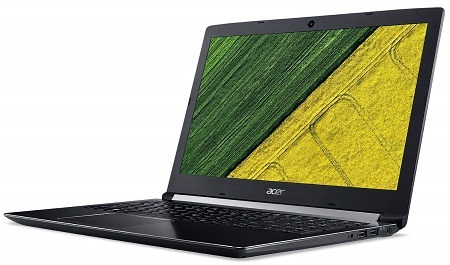 However, Acer was the only brand offering a core i5 laptop under this budget. More good news was that it wasn’t some old i5 processor too. The one I searched for had the latest 8th Generation i5 processor. See the review below of my Acer Aspire 5 Core i5 8th gen laptop under 35000. This laptop is really good for its price range. The bottom part of the laptop is made of aluminium and other material is high quality plastic. When I first opened the laptop it was shipped with a Linux based Endless OS which offcourse I replaced with my Windows 10 OS which I purchased previously with a very good discount. There is no bloatware preinstalled so in case you want to try out the Endless OS, you can do so without any troubles. The best feature of this laptop is that it has an 8th Gen Core i5 Processor which is better than a Core i3 offered by many other laptop brands in this price point. Other good feature included in the laptop is a USB Type-C Port. The screen has a full HD(1920×1080) resolution and there is a 4GB DDR4 ram preinstalled. There are also some not so features such as the screen is not an IPS panel so viewing angles are not so great. Also, the sound quality is not par with like of HP or Asus. Overall if you are looking for decent laptop with a good i5 processor, then this Acer laptop is the best laptop under 35000 with i5 processor and will not disappoint your if you are looking for an everyday laptop with a high performance processor. ← Do you really need to cut out Sugar from your diet to be healthy?